The Debt Repayment Calculator will show you how long it will take to pay off your credit card debt. Choose from making the minimum payment, a fixed amount of your choosing, or a time when you would prefer to be debt free. 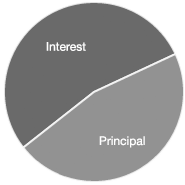 Click on the chart to see how much interest you will pay over the life of the debt.